Winter is coming, and although Texas has relatively mild winter temperatures, you will need to make adjustments to the care you provide your horses as the season changes. Deer Creek Structures strongly recommends making seasonal changes to help you and your horse better face the winter season together. Make sure you are frequently checking weather reports to find out how low temperatures are projected to drop. The weather will help you to determine how much hay you will need to stow away for your horses. 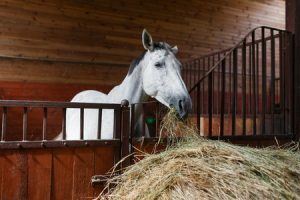 It is advised that horse owners purchase 10 percent more hay than you think you’ll need in order to keep their animals well fed during the cold winter months. In addition to eating hay, horses also benefit from milk pellets, probiotics and yeast. These dietary supplements are packed with energy and protein that can strengthen your horse’s digestive tract. Typically, a horse is fed 2-3% of its body weight per day. During the winter months, thehorse.com recommends increasing a horse’s food intake by 5 to 10 lbs. You can also speak with your veterinarian for their recommended feed change. You will need to be even more careful in preparing for winter if your horse is currently being treated for a chronic injury or illness. Cold temperatures can and will affect a variety of horse medications if not properly stored away. We recommend storing them in your home or a room in your barn with warmer temperatures. Horses use more energy to stay warm during the winter months, which makes it important to have a stock of blankets on hand. Although horses will grow a thicker coat of hair during the chilly winter months, they may still need to wear a blanket to maintain heat. 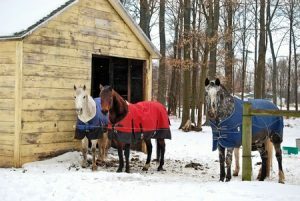 According to Equus Magazine, aging horses, horses that have recently moved from a warmer climate and those who are regularly clipped during the winter months especially need blankets. This article by Equus Magazine is a great resource for all your horse blanketing questions. When the weather drops to 40 degrees, a lightweight blanket will suffice to keep your horse warm. A heavier blanket is preferred in much colder temperatures. Be sure to routinely change your horses’ blankets, checking underneath them for signs of chaffing. Don’t forget about yourself in all of this! Your horse’s happiness is also contingent upon owner health and happiness, so keep yourself warm by buying appropriate winter riding apparel, such as warm turtlenecks and fleece helmet covers, which some equestrian lines have incorporated into their designs. Waterproof boots with weather resistant soles will help you grip the stirrups better, help you feel more secure, and help you care for your horse safely. 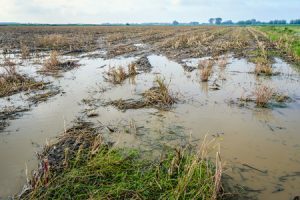 Your land can undergo a lot of changes once cool temperatures and blustery winds come funneling in. You don’t want rain or a light layer of ice to bury faulty fence posts; that just creates one big mess you’re going to have to deal with later. 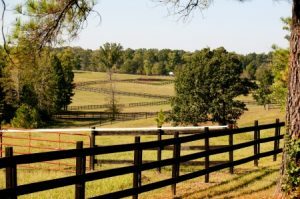 Many equestrians are fans of run-in sheds because they give them peace of mind knowing their horses are free to both roam the pasture and enjoy shelter throughout the day. Older horses get stiff muscle aches during the winter, so this is a great option for them. During the winter months, muddy, slushy and icy conditions are all too common. These conditions can lead to injury, making it incredibly important to keep your horses’ feet and legs clean. We recommend wiping down your horse when they come in each evening, paying close attention to their legs and hooves. You will also want to ensure there are areas of your pasture out of the mud and ice for your horses to seek shelter. If parts of your field are especially prone to muddy conditions, we recommend fencing them off during the winter months. You should also keep plenty of sand on hand, regularly spreading it across areas that ice often builds up. Winter weather may prevent you from taking your horse out for frequent riding trips, but that doesn’t mean they have to remain sedentary. Regular exercise is important both for keeping your horse in shape and for maintenance of routine. Worried about going out for a ride due to icy conditions? Riding isn’t the only way to keep your horse fit during the winter months. You and your horse can also take a brisk walk around your property. This will allow your horse to stretch its legs, neck and back, as well as keep its training top of mind. You can also practice proper stretching techniques with your horses while you’re on the trail. Ask them to lower their nose to the ground and extend their necks. Have your horse follow this routine again, now having them shift their nose toward the side of their belly. Always remember to dry your horse’s coat completely after a day in the pasture or an afternoon of exercise. The thick coat that horses develop during the winter months will need extra attention when grooming. With a few towels and some elbow grease, you can remove most of the moisture that builds up in horse’s thick, winter coat when they sweat. Curry combs and shedding blades should also be used daily on a winter coat. Finally, after your horse is well-groomed, you can cover them with a fleece cooler, which will help to wick away any remaining moisture from their coat. 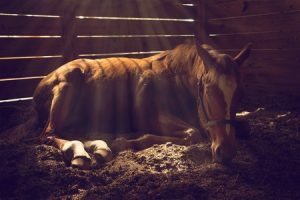 The best location to place your horse’s bed during the long winter months is against the barn door so drafts do not come into their living space. The most common types of bedding are wood shavings, straw, and sawdust. Straw bedding is the easiest to find and reasonably priced, but can get moldy if exposed to rain water. Wood chips are more absorbent and don’t attract as much mold and dust as straw bedding, and softer woods like pine aren’t as rough on your horse’s coat and will make for a cozier resting area. It is critical that your riding companion have absorbent bedding during the winter because ammonia from urine, if left to clump, will irritate your horse’s eyes and lead to other unwanted health risks. Horses, although mighty and resilient, are really fragile creatures demanding a lot of attention and care. That’s why Deer Creek Structures is committed to building barns and sheds only made of top quality materials that will keep your horse protected regardless of what the season may bring. To learn more about our structures and find the one that is best for your pasture, please call us at 254-546-2276.